Steve Austin in an agent for the O.S.O. 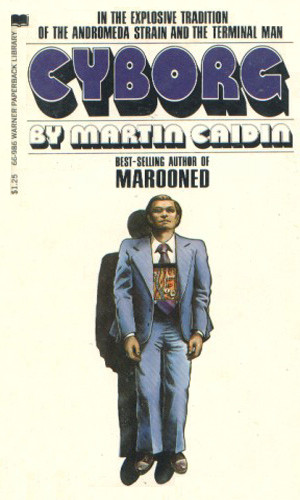 In 1972, noted science fiction writer Martin Caidin published an outstanding novel detailing the use of cybernetics. It was in this book that most people got their first exposure to words like 'cyborg', 'cybernetics' and 'bionics'. 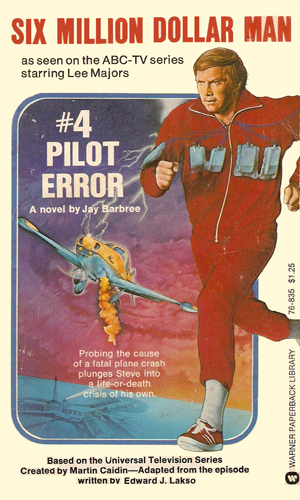 In that novel, an astronaut named Steve Austin, test-piloting a revolutionary aircraft, was critically injured in an horrendous crash. The government, through the services of the Office of Special Operations, chose this opportunity to test its cybernetics program by rebuilding the man better than he had been before. As a service to his country to repay for the high cost for the repairs, Austin is pressed into action as a agent. 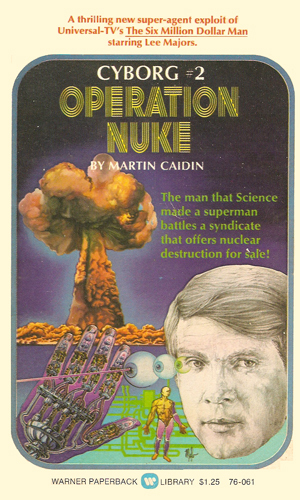 The next year Caidin followed up the first book with a sequel, Cyborg 2: Operation Nuke. 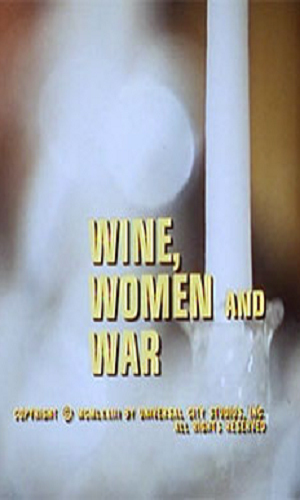 That same year, three different pilots for a proposed television series was shown: "The Moon and the Desert" in March, "Wine, Women and War" in October, and "The Solid Gold Kidnapping" in November. In January of the next year, the actual series began as a mid-season replacement. The show would last 101 episodes with the final one airing in March of 1978. It would also produce three made-to-TV movies, shown in 1987, 1989, and 1994. 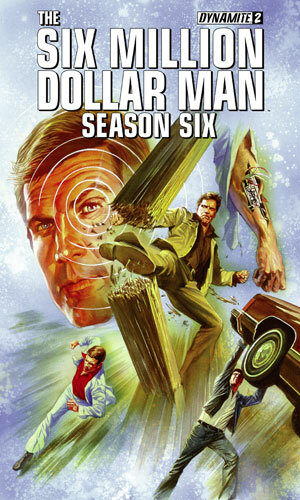 The starring role of Steve Austin was admirably played by Lee Majors, a 33-year old actor who was already well known from his years as Heath Barkley in The Big Valley and who was co-starring as an assistant lawyer in Owen Marshall: Attorney at Law. In the show, the role of Oscar Goldman, operations head of OSO, was played by Richard Anderson. Lt. Col Steve Austin was a highly skilled Air Force pilot who was assigned to NASA for most of his military career. As lead pilot on Apollo 17, Austin was the last American to walk on the moon. With the reduction in the space program, Austin took a position with the test pilot program he had worked with prior to his NASA stint. It was while working with this group that the near fatal crash occurred that changed his life so much. While Austin's entire body was severely damaged in the accident, the major injuries that were corrected by the cybernetic wizardry of his friend, Dr. Rudy Wells, were two leg replacements, one new arm, and a new eye. While the entire matter of the change took considerable amount of time to accept, eventually Austin came around and began to use his new powers in the assistance of OSO and U.S. activities. In the books, the organization that Austin worked for was the OSO. In the television show, however, the agency was the OSI, the Office of Strategic Intelligence, headed by Oscar Goldman. No matter what you might feel of the television show, this is truly an awesome book to read. The whole issue of cybernetics is discussed at length. The trauma of a man suddenly becoming both less human and more powerful is fantastically presented. The writing is just superb. From an espionage aspect, the book doesn't even begin to branch into that area until well into the second half but when it does, it gives two complete missions. The first is to check out and disrupt the creation of a Soviet submarine base in Suriname. The second is to do the same for a Soviet air force base in the Red Sea area. After an extensive recovery period from the troubles of the first two missions, Steve Austin is again called into service when a nuclear explosion in Malagasy provides proof that there is an organization of black marketers selling nuclear bombs. It is Austin's job to infiltrate that group and destroy it. As the primary arms dealer to any terrorist or dictator, Findletter is about to pull off his greatest sale - a complete U.S. nuclear submarine. Steve Austin is sent to stop him. 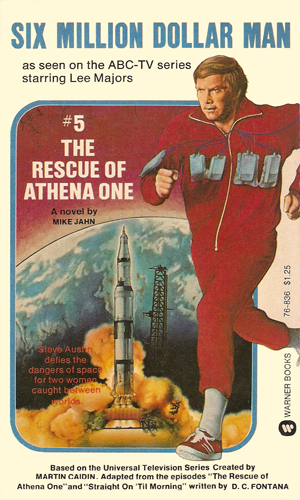 Novelization of the second pilot episode released on Oct 20, 1973. 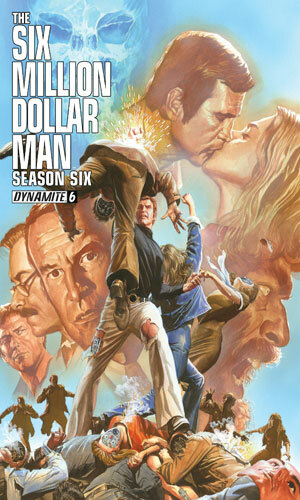 After he rescues an ambassador kidnapped by members of a powerful crime syndicate, Steve Austin earns their animosity. When he sent on another rescue mission, they are ready for him. Novelization of the third pilot episode, aired November 17, 1973. Steve Austin leads an expedition high up into the Andes to investigate what seems like a highway built two miles above sea level. Steve Austin owes a huge favor to Senator Hill for having pushed through the appropriations for his augmentations. Now he hopes to repay some by finding if Hill was the cause of a plane he was piloting. Novelization of the 2nd season episode aired September 27, 1974. Investigating a UFO sighting, Steve Austin finds the lone survivor of an interterrestrial delegation. As he seeks to find a way to return her from where she came, he must also find a way to rescue the crew of a damaged space rocket. Novelization of the 1st season episode aired March 15, 1974. In a competition for supremacy in space, Steve Austin must literally plug himself into the controls of a spaceship. Besides survival, another question is whether he can be unhooked from it later. On Battle Mountain in the northern part of the US, Goldman's team is making seismological investigations but investigating them seems to be Sasquatch himself. Novelization of the two-part episode in the 3rd season aired February 1 and 4, 1976. Steve Austin must rescue a Russian gymnast who is being played as a pawn by the Kremlin. He must also stop an assassin who wants to kill an Arab prince, blaming it on the Israelis. 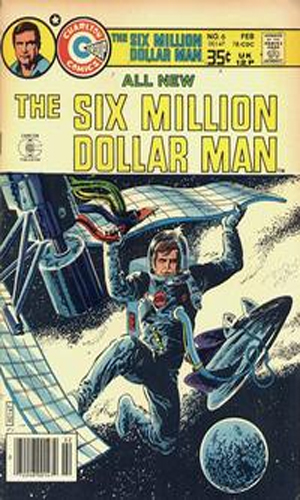 Printed in the 1st issue of The Six Million Dollar Man Comic Book series by the Charlton Comics Group. - After testing an orbiter space craft, Austin wants a couple days off but Goldman say no. Austin does not like the answer. 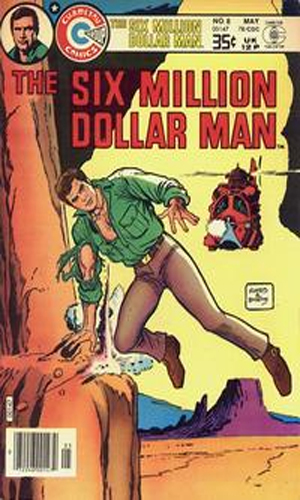 Printed in the 2nd issue of The Six Million Dollar Man Comic Book series by the Charlton Comics Group. - A class reunion for Austin. Using his abilities around the people he grew up with was not in his plans. 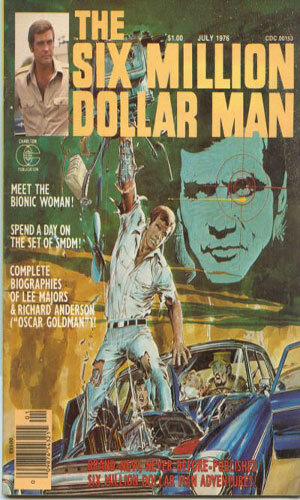 Printed in the 3rd issue of The Six Million Dollar Man Comic Book series by the Charlton Comics Group. - Austin takes some leave and heads to Florida where scuba diving pits him against a very large shark. 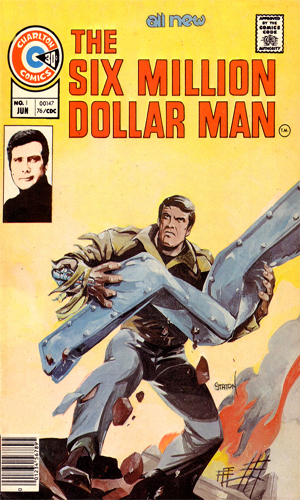 Printed in the 4th issue of The Six Million Dollar Man Comic Book series by the Charlton Comics Group. - Austin learns of a very pricey kidnapping and decides to investigate. 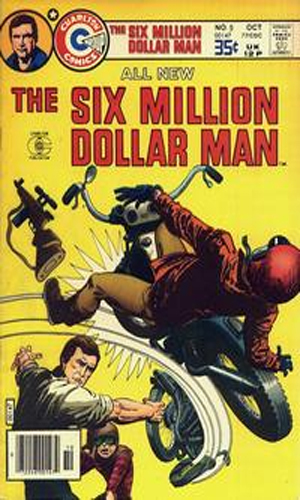 Printed in the 5th issue of The Six Million Dollar Man Comic Book series by the Charlton Comics Group. - Goldman presses Austin into an inter-service boxing match with something naughty up his sleeves. 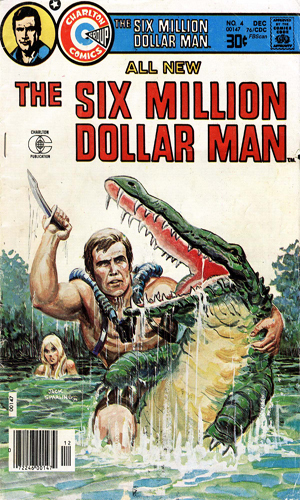 Printed in the 6th issue of The Six Million Dollar Man Comic Book series by the Charlton Comics Group. - On a rainy foggy night drive, Austin come upon a multi-car pileup and a vehicle fire with a baby inside. 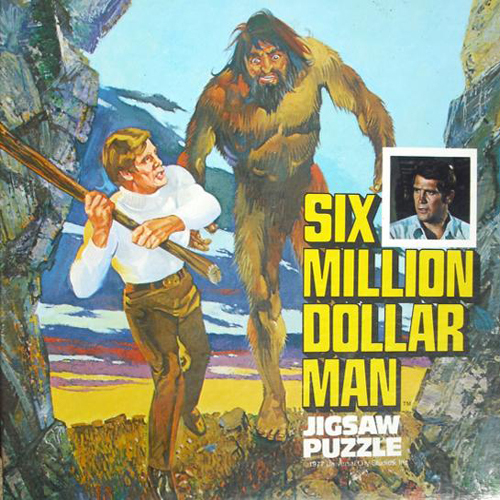 Printed in the 7th issue of The Six Million Dollar Man Comic Book series by the Charlton Comics Group. - Grabbing a bite to eat in an airport during a layover ends up with Austin in an island prison. 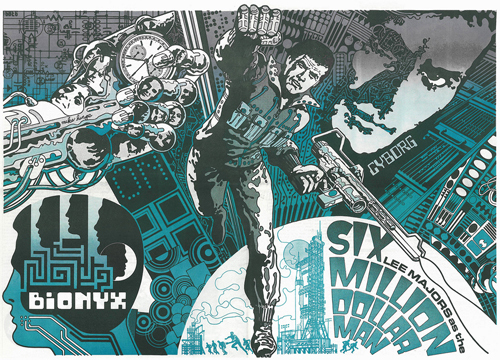 Printed in the 8th issue of The Six Million Dollar Man Comic Book series by the Charlton Comics Group. - An experimental aircraft that could also operate as a one-man sub is being test by Austin. 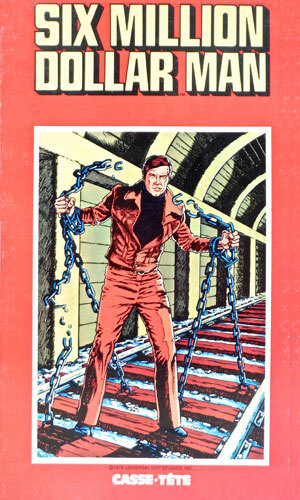 Printed in the 9th issue of The Six Million Dollar Man Comic Book series by the Charlton Comics Group. - Someone is attaching police officers near Austin's home and the latest victim is a good friend. Published by Stafford Pemberton Publishing. A collection of 4 short stories, 3 comic stories, 2 non-fiction articles, 3 games and 1 featured biography as well as many illustrations. Contents are as follows. 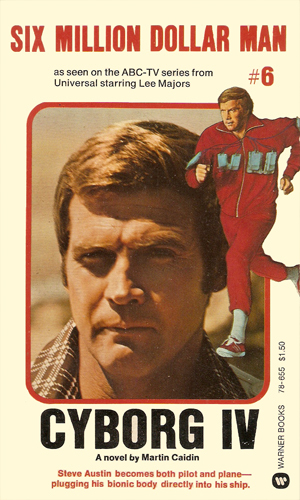 The Featured Biography is about Lee Majors. All six of the movies listed here were made-for-tv movies. The first three were done as pilots for the proposed series while the last three came years after the series ended its run. 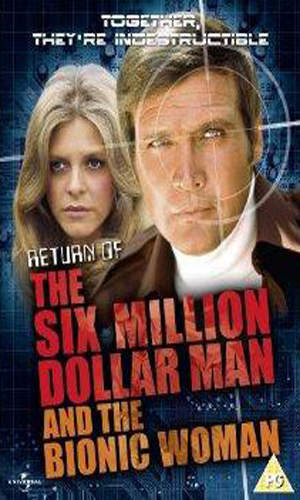 Further, the last three combined the main characters from The Six Million Dollar Man and The Bionic Woman. Test pilot Col. Steve Austin is terribly injured in a malfunction. The OSI steps in to use its revolutionary technology to rebuild him, making him a bionic man, in exchange for which they expect him to work as a covert agent for them. Having failed to get the contents of the safe of an arms dealer, Steve Austin is given a vacation to the Bahamas by Goldman. There he just happens to run into two Soviet agents who are also after the arms dealer, letting Austin know he has been set up. A group calling itself the OSO is quite adept at kidnapping high profile people. They grab a man that the OSI was guarding and Steve Austin is directed to get him back. When Steve Austin and Jaime Sommers rejoin to stop a terrorist group, they must deal with their former relationship. Also, Austin has troubles with his grown son especially after the younger man is injured in a crash and Austin must decide whether to request bionics. 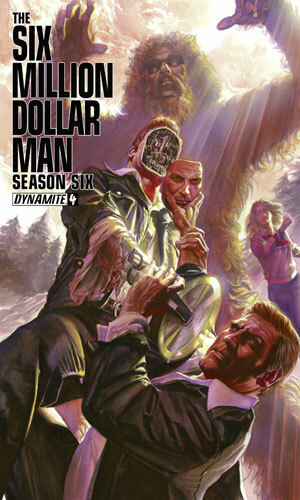 Oscar Goldman is attacked in his office by someone who knew OSI protocols and passwords and who is bionic. Steve Austin, who is providing security at a Goodwill Games, is initially suspected and joins with Jaime to find out who is behind it. They ask for the help of a new bionic operative, Kate. As Steve Austin and Jaime Sommers prepare to get married, Sommers' bionics start to act up and the question becomes who is behind it. Meanwhile terrorists are holding an old friend of Austin and he is determined to get him back. A scientist demands $10 million or everyone in a small town dies. Austin and Goldman are on a plane that crashes on a desert island and must fight assassins who are part of the survivors. Austin goes in search of a kidnapped scientist with the man's ESP-gifted daughter. To infiltrate a research facility to steal the technology of an anti-missile system, a group uses a robot to impersonate the inventor. Austin heads to a small African country to recover film from a crashed spy plane. An atomic bomb is about to explode in an underground Soviet facility hurt by an earthquake. A Special Prosecutor is being hunted by a killer and Austin may have seen him but he may also be wrong. Austin is brought in to help train the first American female in space. Later when she is up there, an accident puts her in charge. While in Austria to receive an honorary degree, Dr. Wells is kidnapped. A crazed scientist is planning to use a powerful laser to kill everyone at a Paris summit. Something in his last space trip has affected an astronaut friend of Austin and turned him into a supercomputer, or a raving lunatic. Wreckage from a '45 plane crash in the Himalayas leads Austin to believe it may have been his father's plane and he heads there to investigate even though it is high up a mountain. The Robot Maker has returned and he has some very nasty plans for Austin. In an auction held onboard a plane, someone is selling an atomic bomb that they do not have. OSI is certain, though, that the individual has a plan to get one. A scientist injects himself with a regeneration serum but puts it too much and becomes super-strong and very much out of control. An important Senator has crashed a plane and Austin is called in to investigate and give his findings. The politician is bringing considerable pressure for a favorable report. The Prime Minister of a friendly nation is in need of a bionic heart. Austin must accompany her to the facility but others want them stopped. Another man has acquired the powers of bionics and he is not so friendly with the OSI or anyone else. Visitors from Mars crash onto Earth. Their touch is deadly to humans and they become pursued by law enforcement. Goldman disappears while on a trip near Las Vegas and all evidence points to his being part of an illegal gold mining operation. The experimentla aircraft Austin was in when he was nearly killed has been rebuilt and he is asked to test fly it again. While helping put earthquake sensors on the ocean floor off a Latin American country, that nation decides to capture the boat and leave Austin at the bottom. When his bionic arm malfunctions while flying a plane, Austin crashes and suffers amnesia. Austin is observed using his bionics by a nosey reporter who is determined to report her findings. An OSI computer programmer is in danger of being kidnapped. Goldman asks Austin to watch over her after she refuses help. Encountering an old love who was recently widowed, Austin is rekindling a flame when she gets word her husband is alinve and living in a foreign embassy. A plane crashed on an South Pacific island where a Japanese soldier lives alone, certain WWII is still going on. The plane contained a nuclear weapon that Austin must get back. The Robot Maker replaces Goldman with a robot who then sends Austin on a suicide mission to break into a high tech research facility. A rare cougar named Taneha is being hunted by the folks of a small town. Austin promises the sheriff he would protect that animal but the woman he is working with has a particular grudge against it. A boxer has plastic surgery to make him look like Austin so he can sneak into OSI headquarters. When Austin learns of it, he poses as the boxer to find out who put the man up to it. A weapons designer is suspected of selling secrets but Austin is certain the man is having his mind read by ESP. Reunited with his first great love, Austin is stunned when she is terribly injured in an accident. He pushes to have her turned bionic. Now bionic, Jaime Sommers is about to get married to Austin when she is sent on her first mission despite a series of recurring headaches and bionic problems. The island nation of Balinderry has a small rebel group trying to take control. 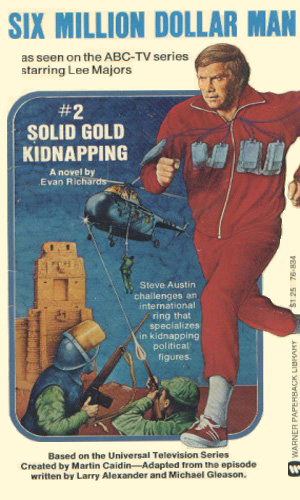 They kidnap the US Ambassador's wife and Austin go after her. Framed for murder, Austin is hunted by the authorities and Goldman and Wells are out of town so cannot help. Austin must rely on Goldman's new secretary. Austin discovers his former fiancee, Jaime Sommers, is still alive but has no memory of him. As he tries to help her, she begins to suffer severe headaches. Suffering headaches, Sommers asks to be given a mission. Austin joins her on it but begins to believe he is the cause of her agony. A bomb expert wires the Liberty Bell with explosives, demanding $5 million. Goldman believes a singer who is an old friend of Austin is really a courier for an enemy power. A friend of Austin is sent to a Japanese island to locate a wolf boy. He asks Austin for help. A Middle East crown prince in at Edwards AFB learning to fly jets when an attempt on his life is made. A missing government agent is the reason Austin is pretending to be a lumberjack at a large lumber company. A key player in a pro football game goes missing and his friend Austin is determined to get him to the game on time. A bionic agent is in a car race when he loses control and crashes. A former OSI scientist tries to recruit him and his ability for crime. A smuggling ring is dealing in very hush-hush detection devices. To stop them, Austin takes the role of a longshoreman. Several government agents have fallen victim to snake bytes as they investigate a moonshine operation in Georgia. Austin is then called in. A former defector to the Soviet Union wants to return but his son would rather stay in Russia. All evidence points to a janitor at OSI as the leak for top secret information but when confronted, he claims to be working for another organization, the OGA. Yet another leak at OSI seems to be coming from Goldman's main secretary, Peggy Callahan. Slowly regaining her memory, Jaime Sommers is ready to resume a normal life as a teacher but also wants to do an occasional mission. To get close to a crook who owns a night club and is possibly smuggling secrets, Austin goes undercover as a magician. The disappearance of two geologists in California is made more mysterious by the finding nearby of a giant footprint. Looking for proof of Sasquatch in California, Austin comes across a group of space aliens. When Goldman asks Austin to help guard a statue called the Golden Pharaoh, they are surprised to find it is a fake. Austin is put on bodyguard duty for a Russian female gymnast who promptly falls for him. To find out if a veteran cop is behind the theft of nuclear bomb parts, Austin goes undercover as a rookie. Austin volunteers at a friend's Big Brother group and meets a young man he decides to mentor. Austin is the prime suspect in a series of breakins that seem like they used bionic powers. A space traveler he had met before tells him it is Sasquatch at work again. Test Pilot Kelly Wood is shot down by a Japanese Zero from WWII but there is no proof of it and all evidence points elsewhere. A comedian has had an implant put into him by a foreign power and is controlling him. Austin is asked to bodyguard. Someone is messing with chimps on an island research facility and when Goldman and Wells go to investigate, Wells is infected. A spy called Omega is stealing OSI secrets. Austin pretends to be a man selling them to trap the spy. 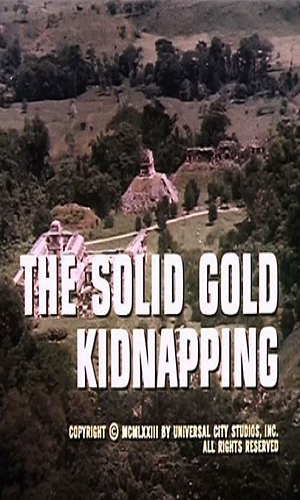 Jaime Sommers is injured trying to rescue Goldman from kidnappers and Austin goes it alone. (Part 1 and 3 are in The Bionic Woman. A young man is injured in a landslide that took his father. Once OSI provides him with bionics, he tries to clear his father's name and Austin must help. To get his hands on jets to improve his revolution, rebel leader Falco threatens to blow up US installations. Austin joins the Thunderbirds flying team as a cover to protect an Arab prince marked for assassination. Austin uses his powers to turn an NASA contractor CEO into a nicer person. Austin fakes his way into a gang that is planning to steal a $30 million rocket. A new OSI technology can infuse computer data straight into a human brain. They use it to create a super-smart agent. A Russian Mars probe crashed in the US and starts to go berserk. Austin joins with a beautiful Soviet agent to stop it. A teenage boy accidentally comes up with a very powerful fuel. OSI is interested in it but so is an unscrupulous contracter. A plan to resurrect what is thought to be finished oil wells is being sabotaged. Foreign boxers are suspected in a plot to kill a Chinese official so Austin goes undercover as a boxer to get close to them. It is suspected that an East German scientist who has created an antiaircraft system is out to mess up B1 bomber tests in the US. When a former British naval officer gets his hands on an old u-boat, he also gets control of nerve gas he uses to extort money from the US. The Soviets offer an American scientists a lot of money to switch sides. Austin takes his place to find out what they are working on. Two scientists are trapped by a cave-in in Indian territory. Austin asks an old friend for help getting them out but a medicine man has other plans. Austin is the suspect with a top secret formula goes missing and he decides to find the inventor to get to the truth. Austin is sent to find out what happened to a nuclear submarine. He has to combat ferocious sharks under the control of the sub's rogue commander. Assigned to help with the linking of two satellites, Austin unknowingly steps in the way of a man planning to steal missile defense technology so he is marked for elimination. Left behind by the space aliens who created him, Bigfoot was supposed to be asleep for some time but a scientist accidentally awakened him and he is grumpy. A cyclone is headed towards a mountain resort where a group of students are stuck on a malfunctioning tram. To stop a spy from selling OSI info, Austin takes the job of a roller derby participant. A scientist in space has snuck away from studying an asteroid and gone to the moon to change its trajectory. Austin and a female agent are acting as bait to pull in stealers of OSI technology but the bad guys replace the female with their own lookalike. A female test pilot that Austin is seeing socially has disappeared with a plane having the latest stealth technoloty. Austin must win over a very skitish former Soviet scientist who is hiding out with an air show. After crashing a new type of space craft on a deserted island, Austin contacts OSI only to be told six years have elapsed and someone new is in charge. Someone has resurrected the Russian Venus probe that was so deadly a year before and is extorting the government to hand over nuclear warheads. The island on which a satellite landed is inhabited by descendants from alien visitors, people that are susceptible to Earth microorganisms. Austin works with a Countess to retrive a microdot hidden on a valuable painting, then she turns on him. When Austin spots someone who looks like him, Wells is convinced he is losing his mind but a psychic claims it is the spirt of Austin wandering about. A computer that has acquired intelligence is determined to make sure no one messes with it, willing to kill to stay safe. A terrorist has stolen US missiles and a USSR missile launcher. Austin is told to get back the former. A Soviet agent is told to get back both. 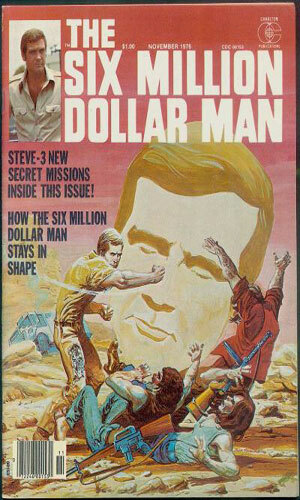 The first Six Million Dollar Man adventure in comic book form was a very short satiric appearance in Scholastic's Bananas magazine in 1976. Since it is not canon, you can find it in the Parodies, Satires, and Pastiches section. 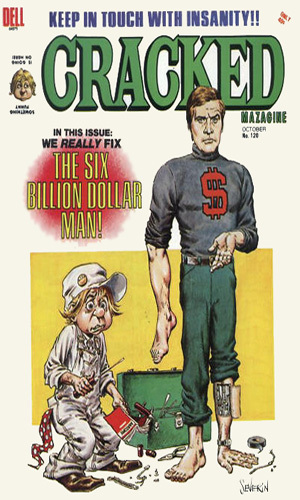 That same year, Charlton Comics, which was surviving at the time by publishing tie-ins to television and movie hits, released TWO different series about the SMDM, one a 9-issue series of The Six Million Dollar Man comics between 1976 and 1978 and the other a 7-issue series of The Six Million Dollar Man "comic magazine" from 1976-1977. The former had one comic story in each publication while the latter had several comic stories and a couple text articles..
Three and a half decades later, Dynamite Comics, in conjunction with noted film director and writer Kevin Smith, brought back the world of Steve Austin in a new re-telling of his origin and the first few missions. 26 issues were written. These were augmented by 5 issues in a storyline showing Steve Austin going up against Jaime Sommers. This series was concluded and followed by a short 6-issue series based more on the original television show, presenting what might have been its sixth season. 1. 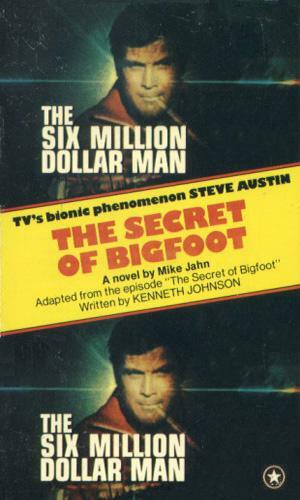 The Beginning of the Six Million Dollar Man - Retailing of origin of the character and based on the first television movie and the Cyborg book. 2. The Secret Web - The Chinese are developing a multiple warhead delivery system and Austin is sent to stop them. He also learns that they are creating a killer robot. 1. 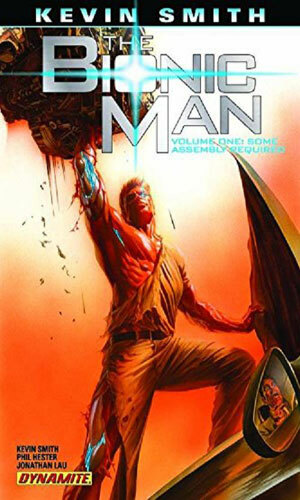 The Cyborg Is Born - Adapts the original story of Austin's crash and transformation into the Bionic Man. 4. 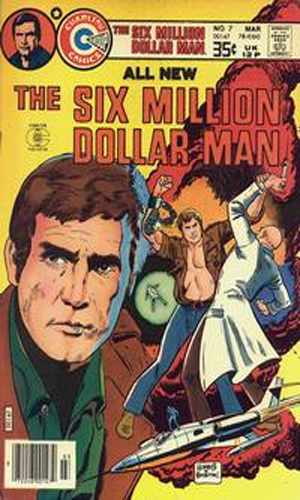 Your Day On The Set Of "The Six Million Dollar Man"
The Six Million Dollar Man Comic #2 - Someone has a small replica of Steve Austin and doing things to it causes the same things to happen to Austin. Includes text short story Win A Few - a class reunion for Austin. Using his abilities around the people he grew up with was not in his plans. Includes 3 comic stories and 2 text articles as follows. 1. Witch Hunt for an Alien - Plot on site already. 2. Steve & Oscar: What Make Them A Great Team! 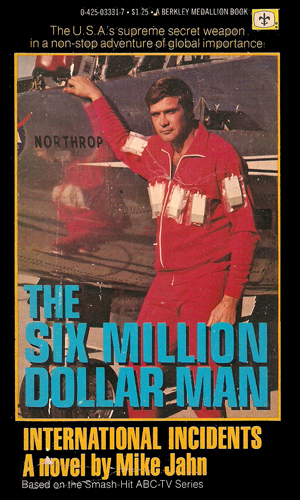 The Six Million Dollar Man Comic #3 - Test-piloting a new aircraft, Steve Austin cracks the time barrier and ends up back just before he accident. He attempts to keep it from occurring. Includes text short story Forbidden Reef - Austin takes some leave and heads to Florida where scuba diving pits him against a very large shark. Includes 3 comic stories and 1 text article as follows. 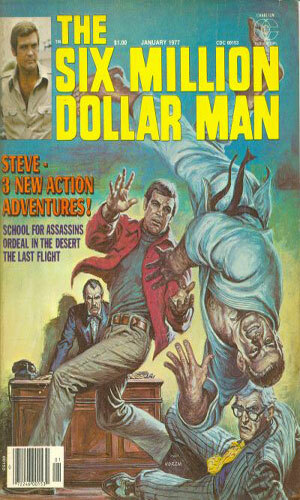 The Six Million Dollar Man Comic #4 - At the end of a mission, Steve Austin has a day-long layover and decides to go scuba diving. He uncovers a plot to kill a Middle Eastern leader. Includes text short story The Ransom - Austin learns of a very pricey kidnapping and decides to investigate. Includes 3 comic stories and 4 text article as follows. Includes 3 comic stories and 2 photo articles as follows. 1. 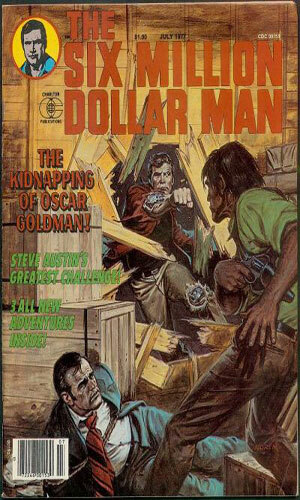 The Kidnapping Of Oscar Goldman - When Oscar is kidnapped, Steve has to deal with internal security. 2. 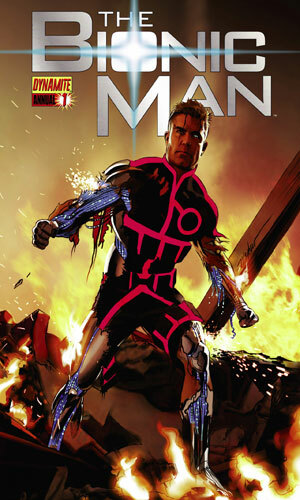 The Changing Man - A test flight into outer space transforms a fellow pilot because of radiation and Steve must fight him. 3. A Model Prisoner - Agents of an Enemy try to dissect Austin to find out about his bionics. 2. The Six Million Dollar Man Looks Before He Leaps! 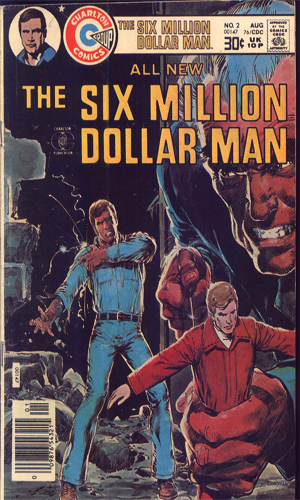 The Six Million Dollar Man Comic #5 - a meteor landing near a farmhouse begins an adventure that includes Steve Austin seeing a man who wasn't there. Includes text short story Counter Punch - Goldman presses Austin into an inter-service boxing match with something naughty up his sleeves. Includes 3 comic stories and 2 illustration layouts as follows. 2. An Alien Charm - Austin encounter some Aliens that can shape shift. 3. Deadlier Than The Male! - Austin is assigned to protect a Middle-Eastern Prince from Assassins. 2. 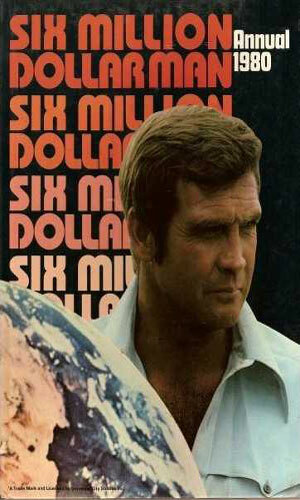 Nothing Can "Bar The Six Million Dollar Man!" 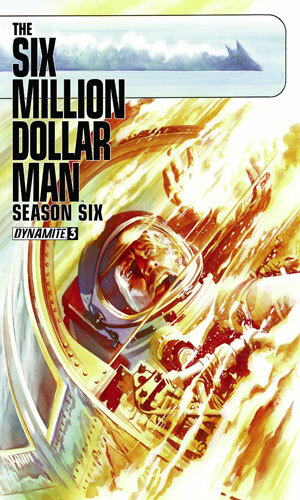 The Six Million Dollar Man Comic #6 - Someone is commandeering an OSI satellite and Steve Austin is sent to get it back. Include text short story Wall Of Fire - on a rainy foggy night drive, Austin comes upon a multi-car pileup and a vehicle fire with a baby inside. 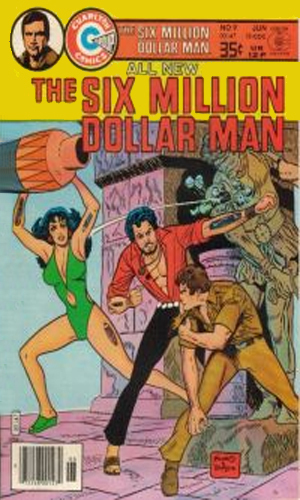 The Six Million Dollar Man Comic #7 - Steve Austin is ordered to be the main bodyguard for a Middle East leader intent on jacking oil prices to hurt the U.S.
Includes text short story The Escape - grabbing a bite to eat in an airport during a layover ends up with Austin in an island prison. 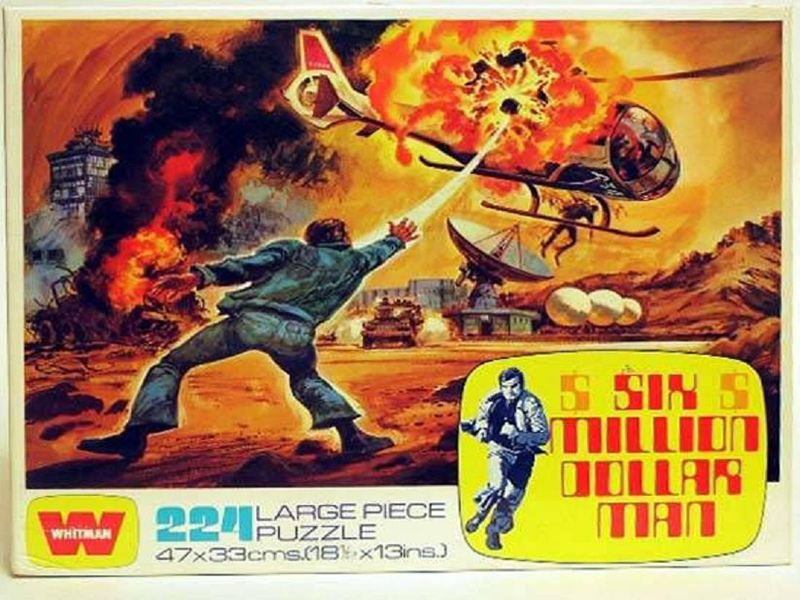 The Six Million Dollar Man Comic #8 - Agreeing to test two jet fighters from competing companies has Steve Austin in danger from different directions. Includes text short story Crash Dive - an experimental aircraft that could also operate as a one-man sub is being tested by Austin. 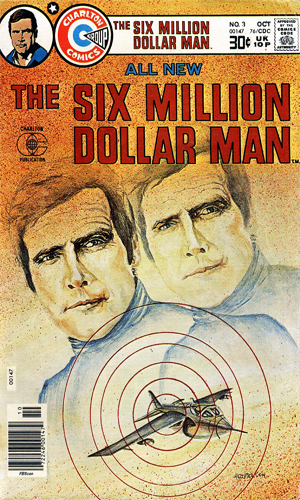 The Six Million Dollar Man Comic #9 - Steve Austin is finding his systems are getting progressively more sluggish and when he asks to see Dr. Rudy Wells he learns Wells has been missing for two months. Includes text short story Bait - someone is attacking police officers near Austin's home and the latest victim is a good friend. 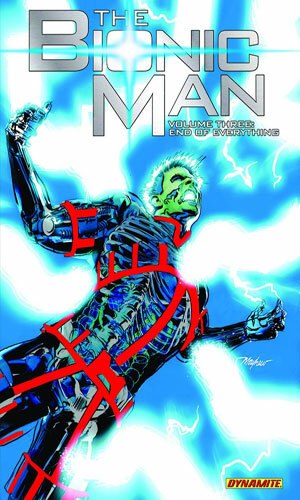 A Trade Paperback that collects issues #1-#10 of The Bionic Man comic series. Steve Austin is back and Kevin Smith unleashes a new high-octane version of the Bionic Man for the 21st century as only he can. It's an innovative take on a classic character that gives Austin a whole new set of powers and abilities. A maniacal enemy built from deadly technology will collapse entire nations if not stopped by Austin. Also reunites him with Jaime Sommers. 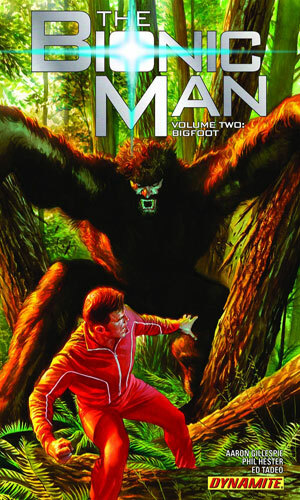 18 The Bionic Man Volume Two: Bigfoot! 1. 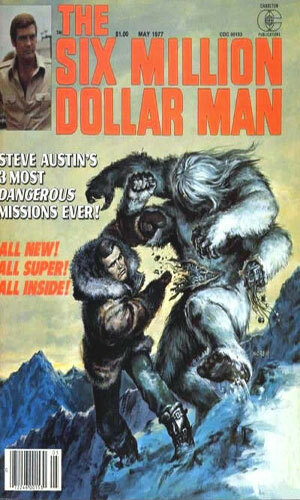 The Back Forty (Issues #11-#15) - The hero Steve Austin (The Six Million Dollar Man) ends up tracking the legendary Bigfoot who happens to be his strangest adversary yet. It's a primal instinctive creature with mechanical parts. In a foreign territory he must unravel the deadly conspiracy of the creature and find out if there are more. 2. 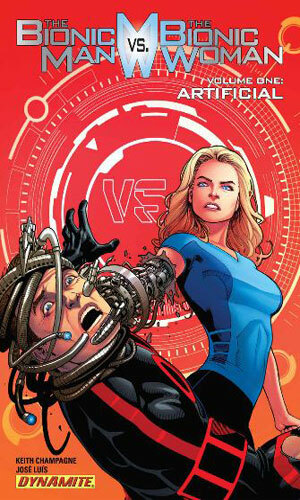 Collaterally Damaged (Issue #16) - Austin reunites with Sommers only to discover that he may be responsible for her transformation that turned her into The Bionic Woman. 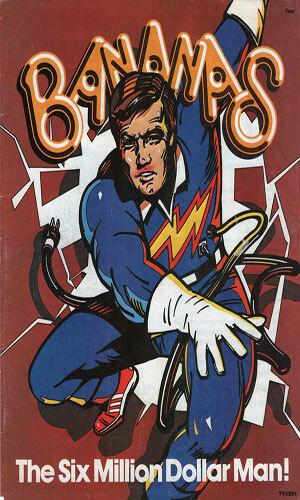 A Trade Paperback that collects issues #17-#26 of The Bionic Man comic book series with 2 Comic Stories inside. Steve Austin (an iconic character and hero from television) is back in action. He goes up against a mad dictator hell bent on squashing rebels even if he has to destroy his own country and kill millions of innocent people. 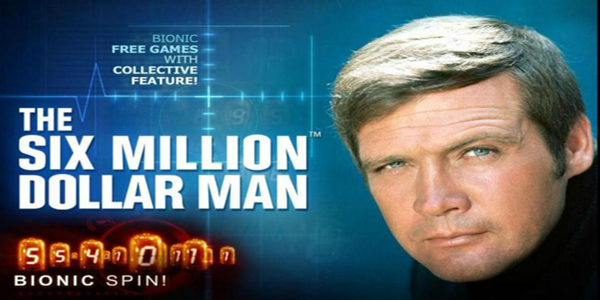 Austin (The Bionic Man) must stop this nuclear possibility. Steve and Jaime (The Bionic Duo) together again go up against rogue OSI agents. Just who are the ones that want an end to the OSI, Austin and others? 1. Venus Death Probe - The Chinese spacecraft meant for the planet Venus crashes somewhere north of Alaska. The US and China want the high tech secret it holds. 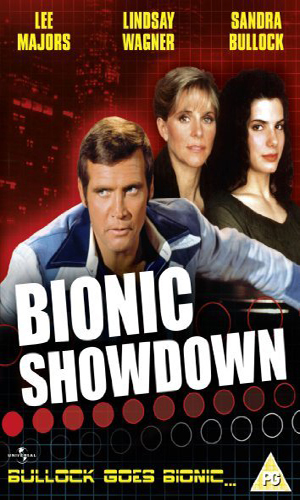 Steve Austin (The Bionic Man) is sent to track it down. But can he beat a machine determined to complete its mission no matter where it has landed. Trade Paperback containing the 5-issue release: Steve Austin and Jaime Sommers are together again and at each others throats. Because of their own tactics in solving a case and a tragic past they end up against one another in a fight of bionic strength. From Cracked Magazine #120 with 6 black & white pages. A hilarious mission with TV's Bucket of Bolts! Stebe Awkward was an astronaut that had to have an operation that cost the U.S. Government a huge bill. So, Stebe became an agent and his first mission was to get a submarine back that is in the Andes Mountains and Oskie a vanilla cone. Yet when he returns with the sub he discovers that he's been recalled. 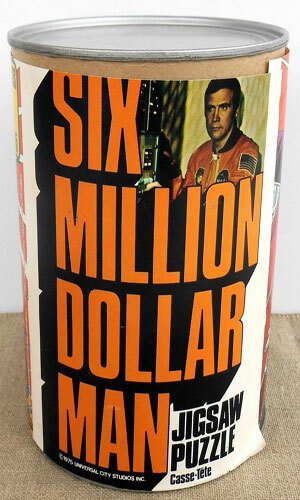 2 The Six Million Dollars, Man! 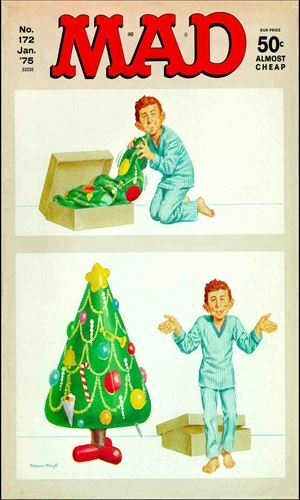 Printed in MAD Magazine #172 and from "The Sum of the Parts Dept." 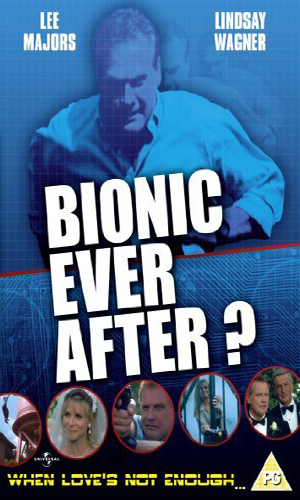 - A parody of the TV series with a bionic man. Starring Lee Majors as Steel Awesome, Richard Anderson as Roscoe Brassman and Martin Balsam as Doctor Balsawood. Astronaut Steel Awesome is injured and given bionic parts, then must rescue the doctor who saved his life from the Soviets. He also meets "The Ten Million Ruble Woman" who falls in love with a Pepsi Magazine. After he returns with the doctor he is then put into a Government Surplus Sale for only $6.98 (as is). 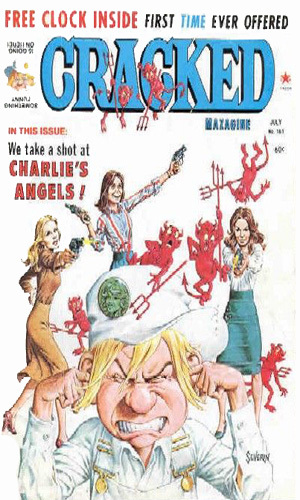 Reprinted in the summer of 1979 in the Mad Super Special #27. From Cracked Magazine #123 with 5 black & white pages. 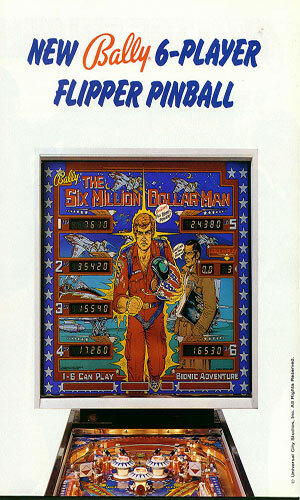 President Ford needs help so he uses four guys that he calls Super Heroes. They are Lee Majors as The Six Billion Dollar Man, Henry Kissinger as Super K, Tom Laughlin as Silly Jack and David Carradine as Kung Phooey. So is born Ford's new group of heroes called 'The Far-Out Four' and their mission is to help the U.S. economy. Eggs at 9 cent a dozen and a gallon of gas as well. That would be great, for sure. But it looks like Hubert Humphrey has his own Super Heroes. They are Bobby Fischer as Super Chessman, Dean Martin as Super Guzzler, Hank Aaron as Super Slugger, Mark Spitz as Super Swimmer and Billy Joe King as Super Net Star. 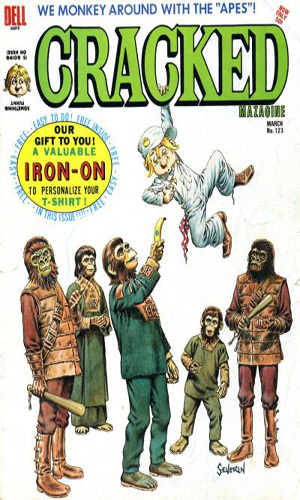 Bananas Magazine #4 - A parody of The Six Million Dollar Man. 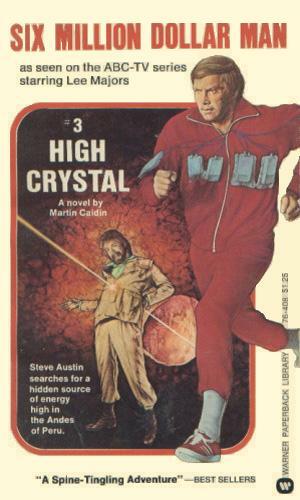 The story is of the creation of a Bionic Man, but he is named Steve Houston. 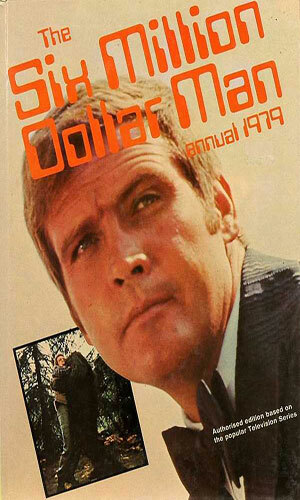 Issue also includes an article called Lee Majors: The Best Superhero Money Can Buy! 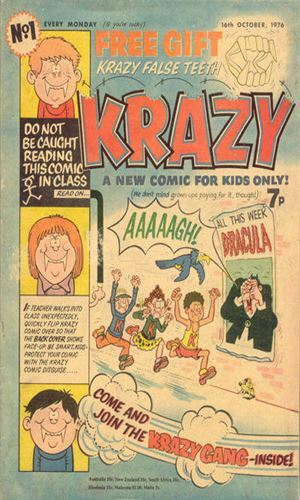 From Krazy Comic No. 1 with 1 black & white page. A KRAZY look at TV No. 1 - Steve Austin and Jaime Sommers greet each other by saying "hi" and shaking hands, bionically. They then fall apart to the ground. 6 If Frankenstein's Monster Did Guest Appearances On T.V. 1. The Walled-Ins (The Waltons) - Franken Boy is thought weird & strange by John and Lully, plus Grandpa is ticked at him for eating the chickens. So he become the family scarecrow. 2. 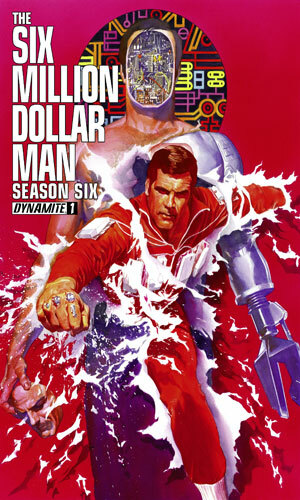 The Six Billion Dollar Man (The Six Million Dollar Man) - Oskie introduces Stebe Austin to Mr. Stein (aka The Original Six Hundred Dollar Man). He happens to be Stebe's father. 3. Laverne And Shirley (Laverne & Shirley) - Shirley has a new boyfriend and it's the Frankenstein Monster, but she wont get mugged now. 4. Good Tymes (Good Times) - Mykel is saved by his new friend Frank from bullies. J.J. thinks it "Dynomite! Then Frank ends up staying because he likes Delma's cooking. 5. Happy Daze (Happy Days) - The Monster join the frat of Richie and Potsie. The Fonz says he's a wimp, nerd and clod. Then Fonzie meets him and makes him Cool. A 200 piece jigsaw puzzle that measures 11 x 17 inches when complete. Persons unseen have chained Steve Austin to the tracks in a subway or railway tunnel not knowing of his true bionic strength and power. After they leave he starts to brake these very chains. 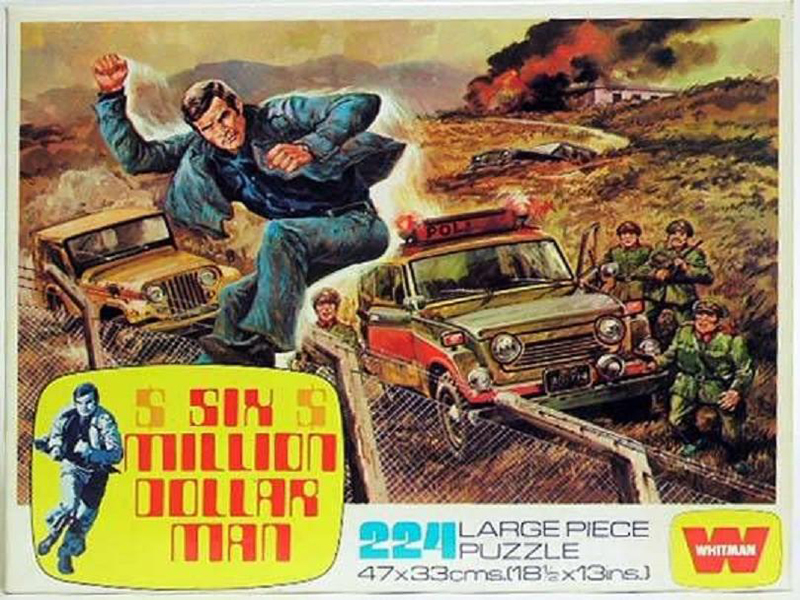 The likeness of Lee Majors as Steve Austin is clearly used for the puzzle. A game for up to 4 players based on the popular TV series. 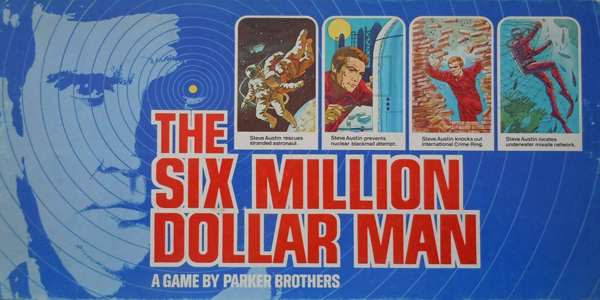 Each player has to prove being the real Six Million Dollar Man. The Spinner (Computer) read out a player's moves giving them the power to take the assigned mission. Power Cards can be used to make moves as well. Each assignment makes one stronger. The stronger that player becomes, the faster they move around the board. The player that is the strongest that makes it back to the Bionic Research Lab is the winner. Game includes board, spinner, power cards and playing pieces. 1st in a series of 3 puzzles that came in it's own cylinder cardboard canister with a photo of Lee Major on it. It has 200 pieces and most likely measure 11 x 17 inches when completed. Depicts Steve Austin breaking out of a prison cell by going through the brick wall and knocking over the guards standing near by. 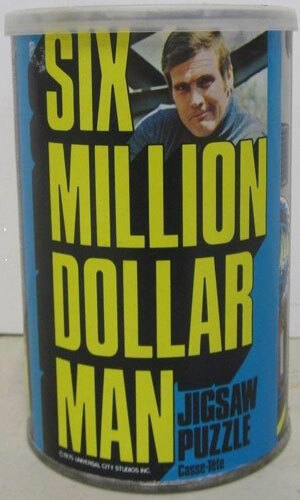 2nd in a series of 3 puzzles with a photo of Lee Majors that came in it's own cardboard cylinder canister. Most likely it measured 11 x 17 inches like the 1st and has 200 pieces. Depicts are hero Steve Austin lifting a barrel of dangers chemicals in what appears to be a plant of some kind and hitting some men with it. 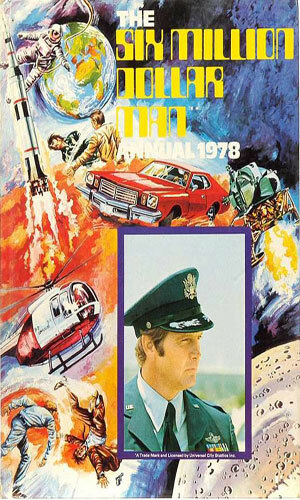 3rd in a series of 3 puzzles to feature a picture of Lee Majors that came in it's own cardboard canister of cylinder shape. Measuring 11 x 17 inches most likely when put together and has 200 pieces like the other two. Depicts woman in possible danger of being crushed by a car and Steve Austin lifting it to save her using both of his arms bionically. A game for ages 8 to 14 and up to 4 players. It is a game kind of like Battleship and based on the TV show that was popular at the time. 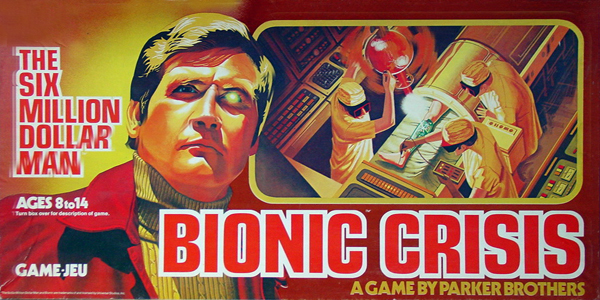 Players raced to complete Steve Austins's bionic circuits. First player to complete a circuit is the winner. Includes 4 Circuit Boards (boxes), 4 Console Cards, 24 Bionic Circuit Cards, 48 Number Cards, plus Red Pegs for correct sand Yellow Pegs for incorrect guesses. 1st in a series of 4. A large 224 piece jigsaw puzzle that measures 47cm x 33cm (18.5 x 13 inches) when completed. 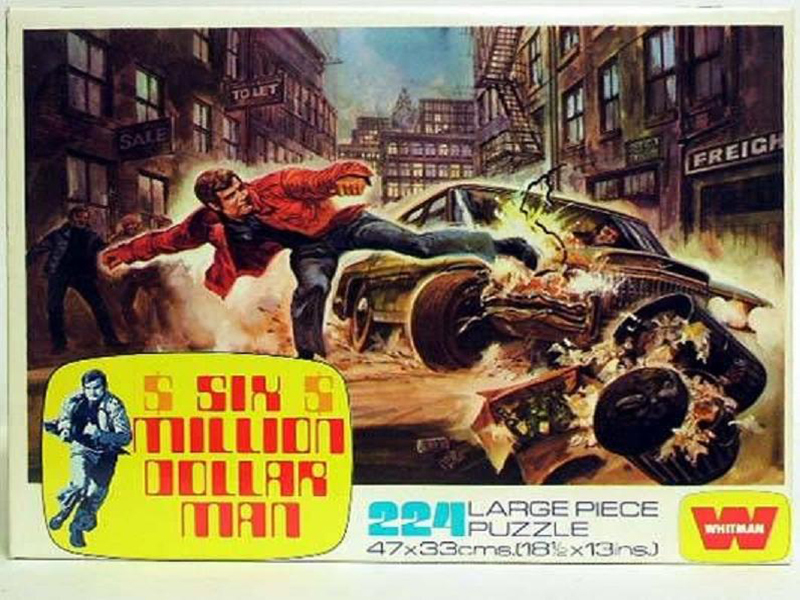 Depicts in animated form Steve Austin (Lee Majors) kicking a car that ruins its front passenger side causing it to wreck. 2nd in a series of 4. A large jigsaw puzzle the measure 18.5 x 13 inches (47cm x 33cm) with 224 pieces after completed. 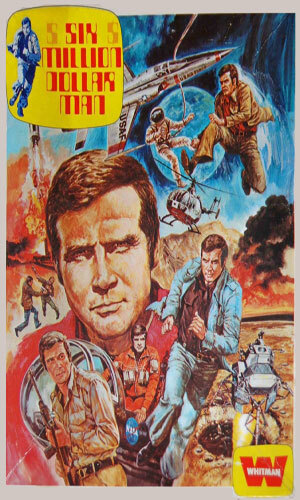 Depicts in animated form Lee Majors (Steve Austin) in a battle with a helicopter. 3rd in a series of 4. Measuring 47cm x 33cm (18.5 X 13 inches) this jigsaw puzzle is large in size and has 224 pieces. 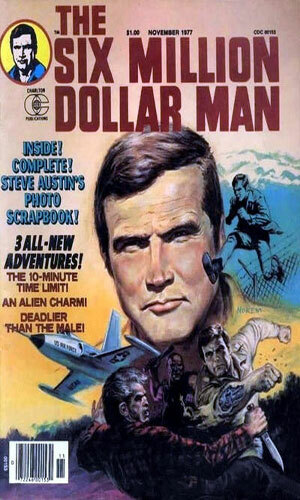 Steve Austin (Lee Majors) is depicted in animated form. He is leaping over a fence to escape from the military police of the enemy. 4th in a series of 4. A large sized jigsaw puzzle that has 224 pieces and when put together measure 18.5 x 13 inches (47cm x 33cm). 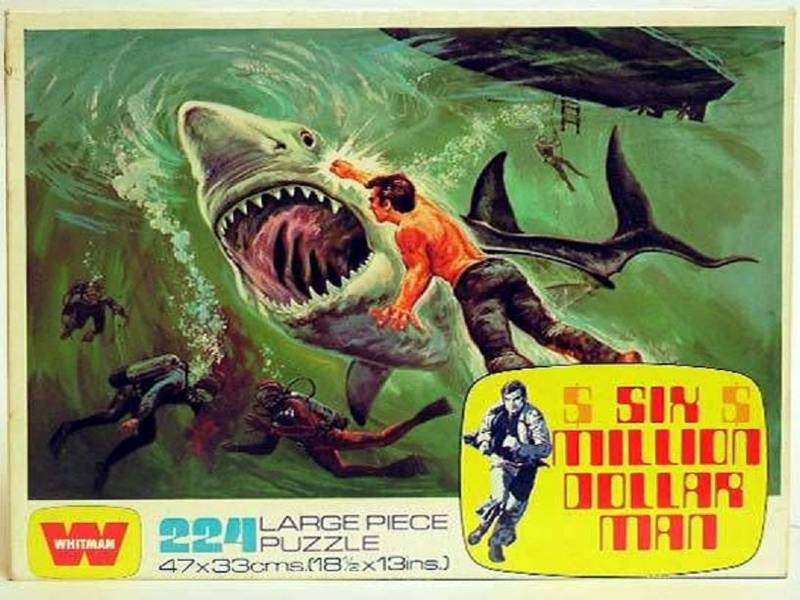 Lee Majors as Steve Austin is with other drivers when they encounter and confront a Great White Shark. This puzzle like the others is in animated form. 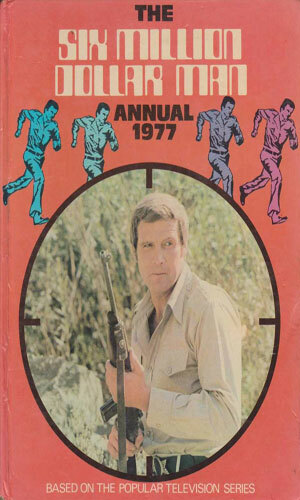 A game contained in The Six Million Dollar Man Annual 1977. A large 300 piece jigsaw puzzle that when completed measures 55.5cm x 42cm (about 21.75 x 16.5 inches) and depicts many adventure scenes in an animated form. 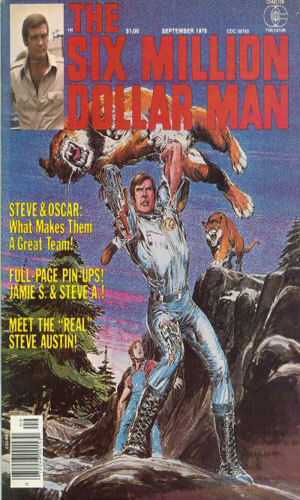 All of them are of Lee Majors as Steve Austin. He is shown running, jumping, flying a jet, getting out of a jet, fighting another man, going into space aboard a rocket, space walking in front of the Moon, possibly landing on the Moon in a lunar lander, in a helicopter moving away from an explosion, holding a rifle and there is also a portrait type image. Looks like he was quite the Adventurer. An Illustrated depiction of Steve Austin (Lee Majors) fighting with Bigfoot (Andre The Giant) that is based on an episode from the TV series. Classified as a 6 players Flipper Pinball game with a famous free ball gate, Bionic power scoring that operated on recall ability, 100% electronic circuitry and a built-in testing switch. The winner is the player with the highest score. 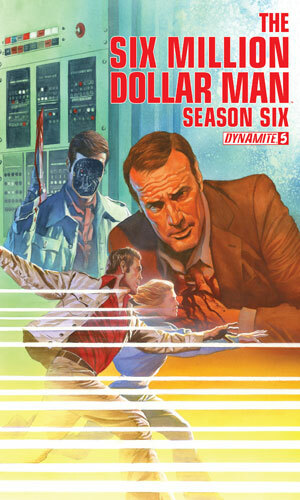 Depicts the likenesses of Lee Majors as Steve Austin and Richard Anderson as Oscar Goldman in animated form. A Video Slots Machine that can be played on a number of online Casinos. It's classified as Bionic Free Games with Collective Features! 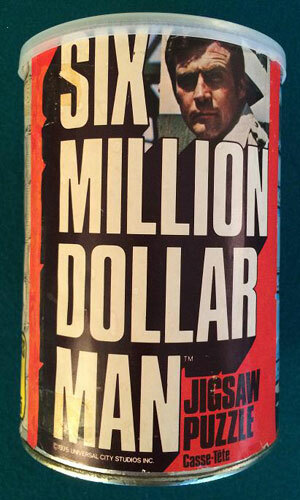 Can a Person win Six Million? It is highly unlikely, but anyone that wishes to try might give it a spin! A Poster that measures 23 x 15 inches that was originally published as the center spread (2 pages) of the 10th issue of a magazine called Moviescene. The artist has clearly given his own take on the iconic character. 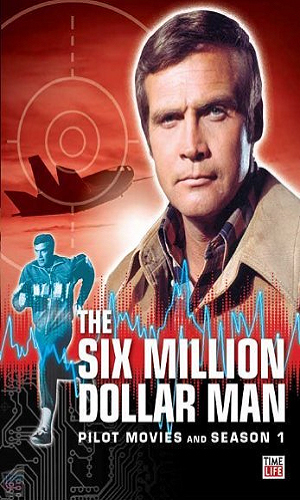 Poster of Lee Majors as the Six Million Dollar Man known as Steve Austin (part man and part machine) who becomes a cyborg after the crash that might have killed him otherwise. This is a rather interesting series, to say the least. It consists of nine books but four of the books were by the original author and were themselves originals while the other five were by different writers and were novelizations of teleplays from the TV show. 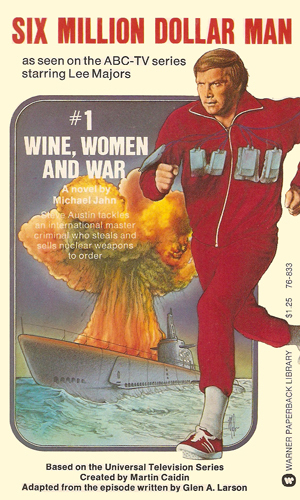 The first book was obviously a total original - a completely unique blending of science fiction and espionage in a way that worked incredibly well. From there on, the series went downhill. I was a big fan of the television series but novelizations are never satisfying as they give the body without the soul, so to speak. They'll do only if nothing else is available. Thankfully, the original works of Mr. Caidin were wisely interspersed among the teleplays. Regarding the grade, had it been rated on the books by Mr. Caidin alone, it would have been a B+ or even an A-. Adding in the novelizations, however, dragged it down.